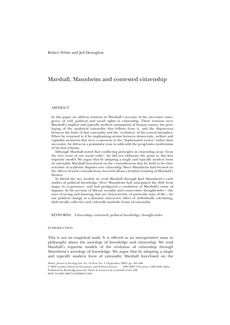 In this paper we address tensions in Marshall's account of the successive emergence of civil, political and social rights in citizenship. These tensions were Marshall's implicit and typically modem assumption of human nature, his privileging of the analytical rationality that follows from it, and the disjunction between the fixity of that rationality and the 'evolution' of his central metaphor. When he returned to it by emphasizing strains between democratic, welfare and capitalist moments that were co-present in the 'hyphenated society' rather than successive, he did so in a pessimistic tone at odds with the progressive modernism of his first schema. Although Marshall noted that conflicting principles in citizenship arose 'from the very roots of our social order', he did not elaborate the point in this first tripartite model. We argue that by adopting a single and typically modern form of rationality Marshall foreclosed on the contradictions that he held to be characteristic of academic disputes over citizenship. Since Mannheim had focused on the effects of such contradictions, his work allows a fruitful revisiting of Marshall's themes. To blend the two models we read Marshall through Karl Mannheim's early studies of political knowledge. Here Mannheim had anticipated the shift from stages to co-presence, and had prefigured a resolution of Marshall's sense of impasse. In his account of liberal, socialist and conservative thought-styles - the ways of seeing and knowing that are characteristic of particular ways of life - he saw political change as a dynamic interactive effect of individually calculating, dialectically collective and culturally symbolic forms of rationality.